Description: Dioecious or monoecious shrubs or small trees. Leaves alternate, entire, often viscid, flat or margins recurved, pale or white-tomentose on lower surface; ± sessile; stipules absent. Flowers axillary, the males often clustered on recurved peduncles; females solitary. Sepals usually 5, broad, often petaloid. Petals sometimes absent. Male flowers with numerous stamens, filaments short, crowded on a hemispherical receptacle. Female flowers with sepals thicker and narrower than in males; ovary 3-lobed; stigma sessile, entire or 2-lobed. Capsule ovoid, 1–3-seeded, on an erect, angular peduncle widened under fruit; seeds oblong, smooth, shining, carunculate. Distribution and occurrence: World: 15 species, endemic Australia. Australia: all States. Leaf blades narrow-elliptic to elliptic or narrow-obovate; fruits 5–9 mm long. 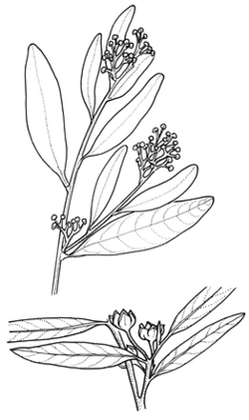 Leaf blades narrow-elliptic to elliptic or narrow-obovate to obovate, 20–90 mm long, 5–30 mm wide; ovaries 3-locular.